Are you a gamblin' man? If so, what would you say then are the odds on proof being found of God's existence? 2-1? 4-1? 20-1? Infinity-1? Seems like a crazy question, right? But, the question of what the odds are on proof being found on God's existence is indeed being asked all over London from the pubs to around the company water coolers. Why is London abuzz over the odds? Telegraph.co.uk reports in their Nov.3, 2008, article by Martin Beckford that the reason is a contest. Their article, "Paddy Power Offers Odds of 4-1 that God Exists" says it all. Bookmaker Paddy Power is placing 4-1 odds that the Large Hadron Collider (LHC) that physicists hope may lead to the discovery of a theoretical sub-atomic object called the Higgs Boson or the "God particle" will prove God's existence. The not yet observed Higgs Boson is supposed to explain how otherwise massless elementary particles cause matter to have mass. In other words, the God particle is what Colossians 1:17 claims, "He is before all things, and in him all things hold together." Paddy Power's contest comes with a £5,000 booty to make the search more interesting. 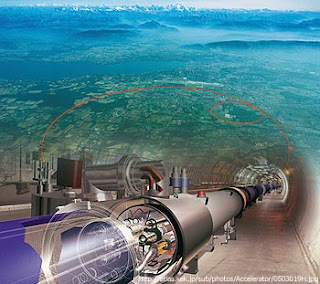 The Large Hadron Collider, sitting on the border of France and Switzerland, just last September was the fear of most of the world because a number of physicists began crying out that the device would create a black hole and destroy the world. Fortunately, the multi-billion pound atom smasher was shut down temporarily because of a magnetic failure and doesn't look like it will be reactivated for months. But, when it is reactivated, betters will be ready. Contributing to the interest in the contest is an atheist-based marketing campaign placing adverts on London buses declaring that "there's probably no God." As Paddy Power is betting with the atheists against God's "discovery," they will stand to lose £50,000 if proof emerges. Whether the theoretical God particle is found or not, my bet would be 1-1 odds. I say that because to me God has already proven Himself. God has proven He exists in that creation itself proclaims it has a Creator. Romans 1:20 states "For since the creation of the world God's invisible qualities–his eternal power and divine nature–have been clearly seen, being understood from what has been made, so that men are without excuse." We can also know God exists through the book He wrote. Today it's called the Bible. The first line of that book goes "In the beginning God created the heavens and the earth" (Genesis 1:1). Another proof that God exists is by a witness, His son, Jesus Christ. Colossians 1:15-17 states "He [Jesus] is the image of the invisible God, the firstborn over all creation. For by him all things were created: things in heaven and on earth, visible and invisible, whether thrones or powers or rulers or authorities; all things were created by him and for him. He is before all things, and in him all things hold together." And finally, proof God exists is that Bible prophecy is fulfilled. I'm not talking about one or two vague prophecies, but all 108 distinct prophecies made hundreds of years beforehand about Jesus' First Coming were fulfilled. That number is statistically impossible to be accidental. That also proves the 500 prophecies in the Old Testament and 1 in 25 verses in the New Testament concerning Jesus' Second Coming will certainly be fulfilled. When you're placing your bet and your life on whether God exists, look at the proof already there, and bet on a sure thing. I have to admit I had a good laugh at the hysterical people thinkging the world was going to come to an end with this machine. Knowing God's plan for the future made all the difference.